Info, Restorationtips and Tricks, Pictures and general Information about my Cadillacs. My humble collection consist of a couple of very nice cars. 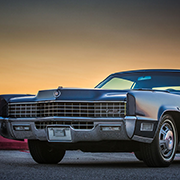 I do own a 1958 Cadillac Eldorado, 1967 Cadillac DeVille, 1967 Cadillac Eldorado, 1974 Cadillac Coupe deVille, 1978 Cadillac Eldorado Biarritz , 1971 Continental Mark III and a 1996 Buick Roadmaster. My website is not meant to show off my cars or to boast about what I have, but to connect with other Cadillac aficionados world wide. I did the first version of my website in 1997 and since then have made many friends through it. I came in contact with so many nice people and this is why I´ll keep doing it. It also serves as a kind of diary for me, to keep track of my car activities and repairs. I´m always happy if my little articles can help others with their own repairs and to solve their car problems. I´m no professional dealer, mechanic, nor do I have any professional car related background. Microsoft browsers are terrible and not fully supported. Some pages take a while to load.